This morning, I thought I still had 15 of the 48 (or so) jars of grape jelly that I canned back in September of 2009. I now have 5 (or maybe less!) remaining. I popped open one of the jelly jars, and to my surprise, I found mold. I ran to the pantry, and grabbed 3 more jars. Same thing. 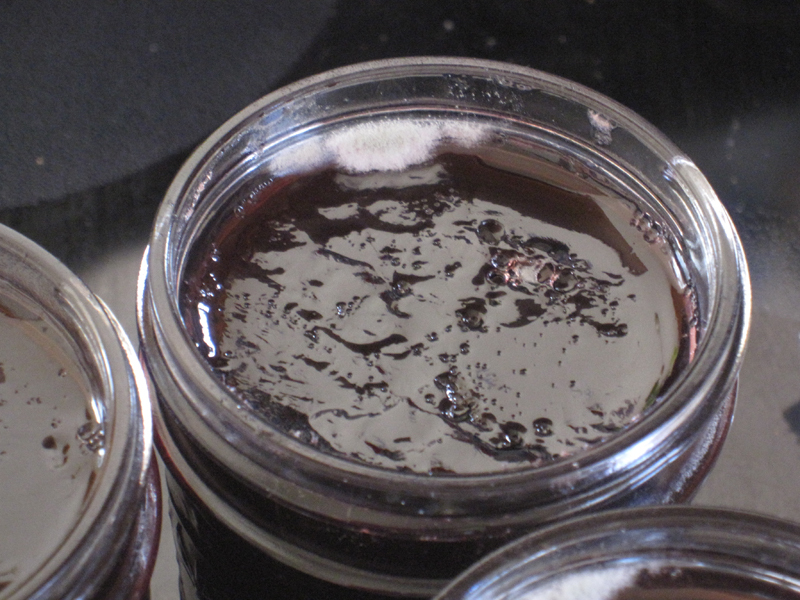 The 5th jar showed no signs of mold or other indicators of spoilage, so I felt comfortable using it. I peeked at the edges of two more jars. They looked okay. I went back to the pantry to peek in the sides of those jars, too. Six had obvious signs of mold, two appeared fine. What happened?!? Ten jars? I've canned a variety of things over the years, using hot water bath, boiling water bath, and pressure canning. The is new to me. The seals all sounded good when I opened each and every jar, but clearly, something happened in the process. I looked at the rims and at the seals, but I'm no expert. There are some spots where maybe I didn't get the rims clean before putting the lids on, but could just be the adhesive in the lid stuck to the jar, leaving an odd patch. I used the recipe straight off the Sure-Jell package. See my fuzzy little friends? Not to happy about that. I went back to my Putting Food By book, and read up on mold. 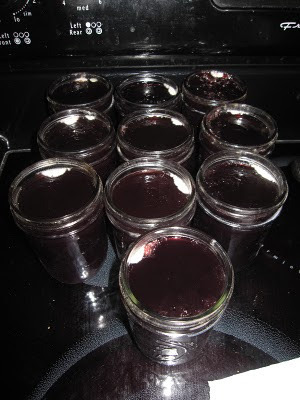 After reading there, I'm totally okay with tossing all that bad grape jelly. Yes, all I see is mold and I know some people would be okay with scraping out the mold and using what doesn't appear to be bad. I feel that's a total recipe for food poisoning right there, and I'm not willing to risk my children on some grape jelly. The book suggested that mold could grow in what appeared to be a well-sealed jar, and mold can eat enough acid to lower the acidity, giving room for botulism to grow. Not something I want to mess with. Note to self - be sure to be vigilant about every step when canning!